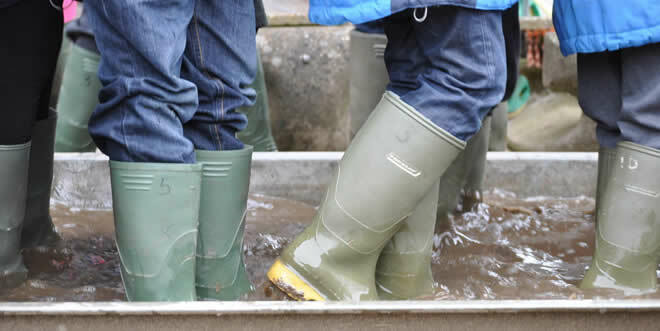 Wellington boots are essential all year round – all visitors must wear wellies provided by the centre. We have a good supply of boots, both for adults and children, at the farm so please order sizes required on the planning sheet above. Children can be given a farm coat to wear to either replace or wear over their own coat. Clothes are likely to get dirty or licked so please advise parents that old ‘playing out’ clothes should be worn. The top half of a school uniform is fine, but uniform skirts and best trousers may become soiled. Trousers or leggings are preferable for everyone, including staff and adults. Shorts are not a good idea even in summer. An extra fleece or sweatshirt is essential during most of the year. Extra socks will help to keep feet warm inside Wellingtons particularly on cold, wet days. A suitable head covering: woolly or fleece hats in winter and caps or sunhats in summer are an excellent idea. Scarves, unless worn for religious or cultural reasons, are not practical as they tend to drop off into the mud or get pulled by inquisitive cows. What refreshments do we need to bring? The children will need a packed lunch and 1 or more drinks if they are staying all day. For Half Day visits you might like to bring school fruit or a midmorning snack particularly if your children are used to this. Childen who qualify for free school meals have an entitlement to a school packed lunch. Some schools let pupils bring their own home food as a special treat but it is advisable to have a few school packed lunches just in case.Your cook will need to be given as much notice as possible of the number of lunches to be provided. Tea and coffee are available for visiting staff at a nominal charge. Souvenir pencils, pens, notebooks and erasers can be sold to the children at pocket money prices. £1 is sufficient for 3 items (see the planning sheet).This is optional but now we are a charity without external fudning it helps to support us. Recently this fund paid for one of the new hen houses, and the winter hay rack for the sheep. We do not sell sweets or food. A farm visit is a practical and sensory experience, but you may want the children to work out some questions or carry out investigations. A camera is a useful way of recording the children’s immediate experiences. Clipboards are not essential but are available in the classroom. If you wish to take some samples, e.g. animal feed, for investigations you will need to bring plastic containers or small poly bags with sticky labels. We do not normally allow children to take samples of leaves or flowers.